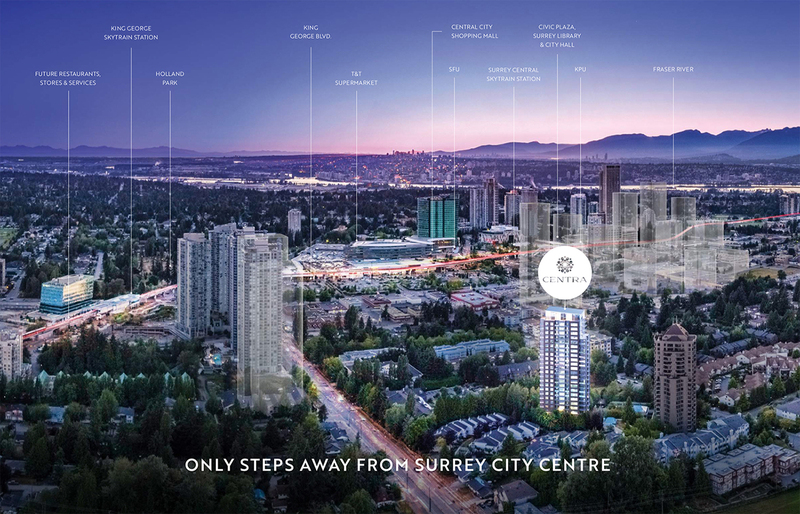 Centra is changing the standard of high-rise living in Surrey City Centre. Located in a quiet, residential area steps from Quibble Creek Greenway and Green Timbers Park, Centra is surrounded by green space to the east while being steps to SkyTrain, shopping, recreation and services to the west. From the outside to the inside, it is equally important to find a home and space that works for you. All homes at Centra feature lofty 8'8" ceilings, climate controlled air conditioning, detailed finishes like quartz waterfall countertops, parking and a storage locker. Every space is utilized as efficiently as possible, resulting in a home that is more spacious and endlessly practical. See for yourself what a 2 bedroom and den home is like at Centra. What was once a suburban town centre, is now a walkable, transit-focused business, cultural and entertainment hub. Connected by SkyTrain, future transit expansion, and roads created for walking and cycling, Surrey City Centre is also known for parks and plazas, and spectacular views in every direction. In the next decade, Surrey will become the biggest city in Western Canada, and what is already a diverse and rewarding city will become the new centre of business and culture in BC. The vibrant energy of the city, or the peace and quiet of the suburbs – you usually have to choose one or the other. At Centra – you can have both. Less than a 9 minute walk from Surrey City Centre, everything you love about the city is just steps away. And when you’re home, its idyllic setting lets you enjoy the peaceful atmosphere of a neighbourhood that gives you access to trails, parks and never-ending views.